O God, who were pleased to give us the shining example of the Holy Family, graciously grant that we may imitate them in practicing the virtues of family life . . . The virtues of family life. A great question we could ask, though, is “Which virtues?” There are numerous virtues that we see at work in the lives of Jesus, Mary and Joseph in the Sacred Scriptures. Certainly the virtue of courage is one obvious example. What could have taken more courage than for a young girl to say, “Fiat! Yes!” and give birth to the Eternal Son of God? In the same way, St. Joseph shows tremendous courage when he consents to take Mary and her child, Jesus, into his care. Specifically, he is told by the angel of God in a dream that King Herod is seeking to destroy the child, and that he will have to flee to a foreign land with Mary and Jesus to avoid this peril. Likewise, the virtue of chastity is one we find beautifully embraced and wonderfully exercised in the life of the Holy Family. Holy Mary remained a virgin, our faith teaches, before, during and after the birth of Christ (in ancient iconography, there are always three stars displayed above the Virgin Mary to express this great mystery). Mary and Joseph lived together and loved each other deeply, but were never physically together as husband and wife; they lived in chastity and in a state of celibate love. They teach us much today by their virtue and love for each other and for God. 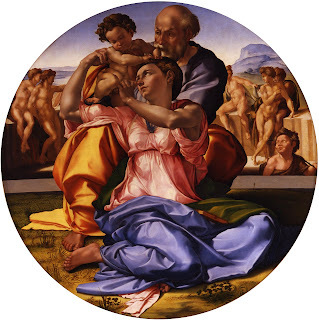 The Holy Family would have also possessed what Aristotle called the “charioteer” of the virtues, prudence. In their choices and their actions they were prudent, choosing the good in exactly the right measure and magnificently showing those around them the power of human freedom and the wonders of a virtuous life. One could fill volumes describing the virtues lived out so gloriously in the life of the Holy Family. But there are three specific virtues that they would have possessed in abundance, virtues that are central to our own families and to our own Christian lives. These virtues are called the Theological Virtues, for they unite us most closely to the life of God Himself. The Theological Virtues are faith, hope and love. The Catechism of the Catholic Church says that the Theological Virtues form us “for participation in the divine nature...They dispose Christians to live in a relationship with the Holy Trinity” (CCC, #1812). In other words, when we choose to believe in what God has revealed, when we choose to place our trust in the God who governs all things and to hope in Him, when we love in all the places where it may be difficult or daunting, when we practice these virtues, we participate more completely in the life of the Holy Trinity. We begin to live more closely united to the Father, the Son and the Holy Spirit. When we choose to act in faith, trust to hope, and will to love, we become more and more open to the power of God working in and through us. In the Gospel passage for this weekend, the mysterious finding of the Child Jesus teaching in the Temple, we can see these Theological Virtues practiced and developed in the life of the Holy Family. The Catechism teaches us that FAITH is to believe in God and what He has revealed (CCC, #1814). More than that, St. James teaches us in the New Testament that faith is not really faith, but remains just an empty sham virtue unless we act on it: "Faith without works is dead" (James 2:17). The Holy Family believed all that God had revealed to them, and they acted on what they believed. St. Luke relates to us this weekend that “Each year Jesus’ parents went to Jerusalem for the feast of Passover” (Luke 2:41). Why did they do that? They went to Jerusalem to celebrate the Passover each year because God had revealed Himself to the people of Israel specifically through the Passover event. In saving them from slavery and death in Egypt and bringing them into the Promised Land, God had commanded Moses to commemorate that salvation through a meal in which an innocent lamb was slain, its blood shed, and its flesh eaten. He commanded that Israel observe a solemn feast of this saving event each year. The Holy Family believed what God had revealed and they gladly went to Jerusalem to celebrate it. But when they went there, faithfully observing all that God had revealed, they discovered suddenly that they had lost their child! Recognising that Jesus was not with them in the caravan, they returned to Jerusalem and they sought for the child . . . for three days! It must have been a harrowing search, indeed. But they did not give up believing that they would find Him. They believed all that God had revealed about this child, that He was to be the Saviour, and they acted in faith until they found Him. They did not think that God had abandoned them or that they were alone in the world, even though they could not see Him and He seemed to be absent from their lives. Do you and I have that same faith? Do we also believe, when it seems like Jesus is not present in our families or in our personal lives in the way we had anticipated, that He is very real and very present? There is one word that hovers over this Christmas Season and seeks to find a home in each of our hearts. It is the word from the Prophet Isaiah that signals the coming of the Messiah: Emmanuel! God is with us! Do we believe that? Do we act on that belief, everyday? When it comes to the Theological Virtue of HOPE, our faith indicates that one of the central components is an abiding sense of trust, placing our present circumstances and our entire future in God’s promises, and not simply relying on ourselves. 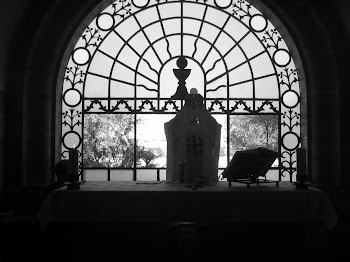 The Catechism states that “hope is the theological virtue by which we desire the kingdom of heaven and eternal life as our happiness, placing our trust in Christ's promises and relying not on our own strength, but on the help of the grace of the Holy Spirit" (CCC, 1817). When Mary and Joseph lost Christ, they did not give up or become despondent. They trusted and hoped in God, believing that somehow, somewhere, they would find Him. What ever gave them the sense that such a hope was well-founded and not just wishful thinking? The great spiritual writers teach us that the Theological Virtue of hope is not so much rooted in what we desire to obtain in the future, as much as it is rooted in what has already happened in the past. In other words, we can hold fast to hope, and trust in the promises of God, because He has already been so very faithful and kind of us in the past. God had revealed to the Blessed Virgin Mary that she would conceive and bear a son, and that He would be the Saviour of the world. She was perplexed by such an annunciation, and exclaimed, “How can this be, since I have no husband?” (Luke 1:34). It was something that seemed impossible to her, and yet it all came to pass in a beautiful and mysterious way. Once the Child was born, Mary and Joseph were confronted with the overwhelming news that King Herod was seeking to destroy Him. Joseph was instructed to take the Child and His mother and to flee to Egypt. There would be no army accompanying them, no guide other than God Himself. But God was faithful. He brought them through. It must have been extremely difficult to travel to a foreign land with a newborn child, but God had cared for them and brought them through that arduous trial. Mary and Jospeh would have remembered these events while they were frantically searching for Christ. Could the God who had brought them through such strange and frightening trials suddenly forget about them while they were looking for Jesus in Jerusalem? Not a chance! Mary and Joseph possessed the Theological Virtue of hope, trusting in the God who had always helped them in the past, and that he would be with them in their present difficulties. Do we? Is our hope founded on God? Are our families founded on this same Theological Virtue of hope? The final Theological Virtue, and perhaps the one our culture today most misunderstands, is the virtue of LOVE or charity. The Catechism teaches that “Charity upholds and purifies our human ability to love, and raises it to the supernatural perfection of divine love” (CCC #1827). The stronger these virtues are in us, then the greater we will possess the grace to dwell in relationship with God. Importantly, the Catechism teaches us that these virtues are not acquired by working really hard for them and they are not the reward of something earned. 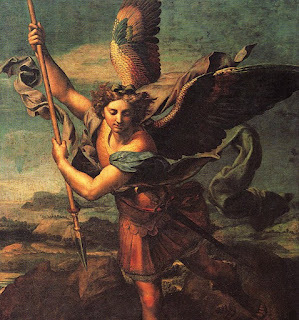 If we want an increase in the Theological Virtues, then we need to begin by asking God for them: “They are infused by God into the souls of the faithful to make them capable of acting as His children and of meriting eternal life” (CCC, #1813). O God, who were pleased to give us the shining example of the Holy Family, graciously grant that we may imitate them in practicing the virtues of family life. Humility, Queen of the Virtues: Checkmate! The conversation of James and John in the Gospel this morning is always difficult for us to listen to. We may even feel embarrassed for them, but we must admit that we are just as weak, and we prove it many times! Nonetheless, the Apostles are focused on ambition and are moving in the “opposite direction” than Christ would have them. The only consolation is that, in the end, they will learn to love and serve as Christ—they will become martyrs, saints—but this morning they are far from that ideal. Because of his affliction, he shall see the light in fullness of days; through his suffering, my servant shall justify many, and their guilt he will bear. It is the cross of Jesus Christ that will save the world (more precisely, it is the love of Christ on the cross that saves us). We are exalted, because he was willing to be humiliated. He humbled himself, and in so doing He shows us the way to live a fully Christian life. Now realize that anyone who doesn’t know how to set up the pieces for a game of chess won’t know how to play well. And without knowing how to check the king, one won’t know how to checkmate it either . . . The queen is the piece that can carry on the best battle in this game, and all the other pieces help. There’s no queen like humility for making the king surrender. Humility drew the King from heaven to the womb of the virgin, and with it…we will draw him to our souls. God cannot resist this “queen of virtues,” Queen Humility! 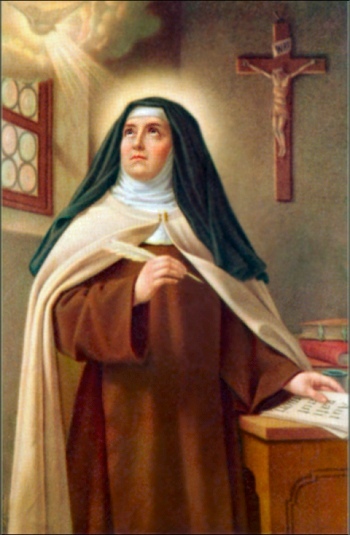 The holy Mother continues to talk about the three essential virtues: humility, charity and detachment from creatures, but the foundation for Saint Teresa is always, always humility. There are always opportunities for us to practice this great virtue as we follow Jesus on the way of perfection. The more we grow in humility, Saint Teresa teaches, the more we will grow in charity and in our detachment, allowing us to become more and more like Jesus Christ. Whoever wishes to be great among you will be your servant; whoever wishes to be first among you will be the slave of all. For the Son of Man did not come to be served but to serve and to give his life as a ransom for many. If we are truly ambitious in the Christian life, perhaps we may also become as humble, detached and full of charity as the Apostles, St. James and St. John. Everything is possible with God, the King who loves us and wants us to draw Him into our souls, where He can reign as He should. Saint Teresa of Avila, pray for us.